This is one unique self defense weapon perfect for civilians, security guards and bail enforcement agents. This stun baton flashlight is one sleek package, made of solid aluminum, not plastic, this sturdy police-style baton can take some knocks and keep on sparking. Bright, loud stunning function is powered by 2 large 18650 size, 3.7 volt, lithium batteries. This is the latest and best rechargeable system made. And the batteries are easily replaceable. You may want to get a couple of extras to change them out when the first set is discharged to avoid any downtime. Operation is very easy, with one button for the stun, one for the flashlight modes. Hold the flashlight button halfway down, when on, to change modes. You have 5 modes, 100%, 50%, 30% strobe and SOS. The led flashlight is very bright and can burn for 180 minutes on one full charge. The batteries can be recharged up to 500 times. 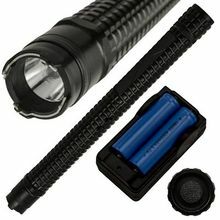 You get the police riot baton, 2 18650 batteries (uses both at once) and a charger for the batteries. This stun gun is made for people in the security service, for professional driver or for self-protection in the private sphere as it is not suitable due to its length of about 34 cm for concealed carry. Its advantages are firstly the mighty power which he offers with its 10 million volts, as well as very useful in the security sector and the private benefit multi-function flashlight with different light programs. As a major advantage count in each case, the replaceable, commercially available batteries the usability of this stun gun over the life of the about 500-700 charges the permanently installed battery out longer. With this of course is also a matching charger. By pressing the spring-loaded trigger caused high-voltage arc between the contacts at the upper edge of the housing of the device. You make an attacker on contact effectively and in a flash incapacitate without leaving any permanent injury to him. The discharges cause an electric shock in the neuromuscular system of the attacker. Residents of Illinois must fax a current FID card to us, and residents of Wisconsin must fax a concealed carry permit to us at 888-345-2533 in order to purchase a Taser or stun gun.